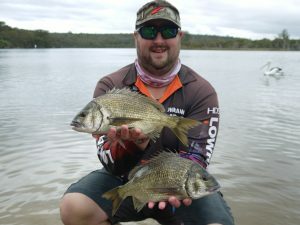 The 2018 Getaway Outdoors & Hobie Polarized WA Bream Classics Kayak Series grand final took place in Western Australia’s south west town of Albany on the Kalgan River. The twenty-five anglers who had qualified throughout the year were highly anticipating whatAlbany had to offer as this fishery can produce some fantastic fishing. The full moon that was present throughout this event made fishing conditions relatively tough with many of the larger fish not on the chew. Added to this dilemma, was Albany’s reputation to produce four seasons in one day with sunshine, heat, cold wind and heavy rain present in moments throughout each day. Yet despite these challenges, the anglers were up to the task and put their talents on display to bring back plenty of fish and quality bags in their pursuit to not only become the 2018 champion but to also be crowned the 2018 angler of the year. nka Crabs covered in ProCure scent against the pylons of the Kalgan River bridge. This ability to resurrect his first day from the brink of a near disastrous day was the most critical element of his angling abilities throughout the course of the weekend. Wasting no time on the second day, Alex headed straight to the Kalgan River bridge to try and emulate what he was able to do during the later stages of day one. Again by covering his Cranka Crabs in Pro Cure scent and throwing them tight against the pylons, Alex took full advantage of the morning bite by not only bagging out in the first hour but also catching what would eventuate to be the events biggest bream for day two weighing in at 1.410 kg’s. From there onwards the action petered out to a rather uneventful day for Alex but the damage was already done and his day two bag of 2.310 kg’s to earn him a two-day combined bag of 4.420 kg’s would propel him to first position on the final standings to claim the championship honours for 2018! Alex did most of his damage using a 7 foot, 2-5 kg Duffrod that was equipped with a 2500 Daiwa Luvias. Spooled onto his Daiwa Luvias was 10lb Daiwa Evo 8 ply braid and attached to his braid Alex ran 5- 6lb Chinu fluorocarbon leader line. Sneaking into second spot by 90 grams thanks to a strong day two performance was Ben Oakes who weighed in a combined two-day bag of 4.020 kg’s. Ben Oakes who is no orphan to long paddles to his preferred fishing grounds once again set off on a trek to the King River which neighbours the Kalgan River. His pattern would remain consistent over the course of the two days and it proved very effective. Early each day, Ben worked the drop offs that border the King River flats using purple Norries Jerkbaits to compile both of his bags. From there onwards he would look for upgrades by locating schooling fish in deeper water with his sounder. Once Ben located these schools of bream he would target these fish with Crawdad coloured OSP Dunks and successfully make the upgrades he needed to bring back two quality bags each day. Ben did his damage on the bream using G Loomis Edge ISR701 rods equipped with Daiwa Certate and Aegis 2506 reels that were all spooled with Sunline Siglon 0.6 PE braid. Connected to his spools of Sunline Siglon braid was 4 and 5 Sunline fluorocarbon leader lines. Rounding out the podium was Shane Owens who lead after the first day but couldn’t emulate his day one performance to remain at the top by the end of the second day. Despite this Shane was able to hang onto third spot with a combined bag weight of 3.930 kg’s. Both days Shane headed upriver as far as Honeymoon Island to pursue the bream that reside in this region. Throwing a mixture of creature baits including the Bait Breath Rockin Crabs, Shane was able to catch plenty of legal sized bream throughout the weekend. Although the bigger fish mostly came on the first day which was reflected with his first day bag of 2.320 kg’s. The second day was a frustrating day as he lost half a dozen fish that would’ve produced a much better bag than what he eventuated with which would’ve given himself a chance of holding onto first spot. It wasn’t to be and with a second day bag of 1.61 kg’s the best he could hope for was to hold onto a top three finish. Shane Owens caught a lot of his bream using a 6”8 Gladiator Psyborg rod that was equipped with a 2000 Daiwa LT Freams reel. Spooled onto his Daiwa Freams, Shane ran 14lb Gosen Casting Braid which connected to his braid was 3lb Nitlon DFC fluorocarbon leader line. 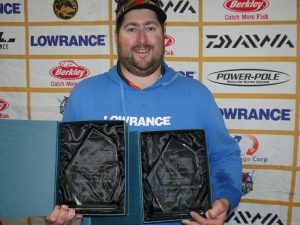 If winning the championship wasn’t already satisfying enough for Alex Greisdorf then the achievement in taking out this year’s Angler of the Year title was the icing on the cake. Coming into the grand final, only one point separated Alex Greisdorf and Joseph Gardner due to a hotly fought contest between the two anglers. The grand final was no exception to this with Joseph in the lead for the title by the end of the first day largely due to his capture of the events biggest bream on the first day weighing in at 1.45 kg’s. Although, due to Alex’s strong second day performance, Joseph was unable to hold onto the lead and in the end Alex won the Angler of the Year title by a small margin of four points. That wraps up what has been a fantastic year of great sportsmanship, comradery and excellent displays of angler skill in capturing black bream up and down the coast of Western Australia in this year’s series of the 2018 Getaway Outdoors & Hobie Polarized WA Bream Classics Kayak Series.